As we commemorate the birth of Our Lord, we pause to thank you for your great kindness to our mission. In the teeth of the winter darkness, Christmas brings a sparkle to the KNOM air signal. As December 25th approaches, our broadcasts are filled with hymns and carols, and our spots, both inspirational and secular, speak of Christmas prayers and the heart of Christmas traditions. Every day, we air one of the two dozen children�s and Christmas stories which volunteers have produced over the years. �A Christmas Carole,� �The Fourth Wise Man,� �The Velveteen Rabbit,� �The Fir Tree,� and many others. Thank you for helping us beam this celebration of Jesus� birth throughout this far-flung region. May the peace and joy of this season fill you, and may God greatly bless you. top SEEING STARS: (left) The KNOM Christmas Star beams 90 feet above the rooftops of Nome atop our microwave studio tower. A simple statement of why we celebrate Christmas, the star has been a Nome tradition since 1971, our first Christmas on the air. That year, our wooden star survived until the last few days of December, when blizzard winds tore it apart. This will be the second year for our latest model, a 5-foot star designed by Les Brown, built of metal electrical conduit. Its lights are tiny halogen bulbs encased in tubes of plastic, the same lighting strips that are used in Las Vegas casinos. 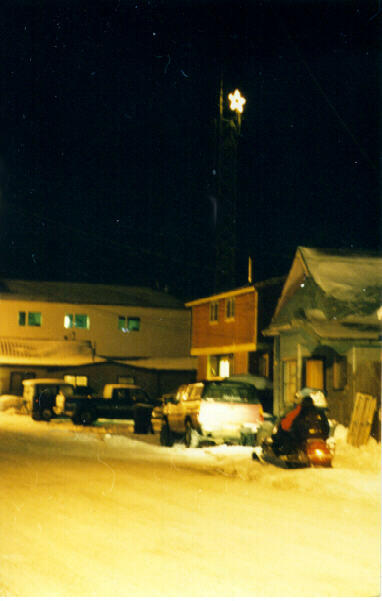 For 1998, Les has added a second tube of lights to brighten the star, which is a peaceful reminder of Jesus� birth that is visible throughout this entire frontier town. CHRISTMAS INSPIRATIONAL SPOT: Prayer is conversation with God. It can be done without words, in the silence of your heart. This season, turn your card writing into a prayer. As you think of friends on your list, offer them a prayer along with your card. SUNNY DAYS: With Alaska�s clean air, the sun can rise white and brilliant on a winter day. Over the course of about four hours, it prescribes a long, low arc across the southern sky above the frozen Bering Sea before setting in the afternoon. In Nome, it�s so low that at its highest, a six-foot person will cast a shadow 170 feet long! Christmas reminds us that it is not enough to bring God into our hearts. When God comes, God never comes alone. Jesus asks us to take in His friends, His dispossessed and uprooted children, and His unpopular causes and projects. Meet KNOM volunteer MICHAEL WARREN (left), who hails from Long Island and was graduated from Villanova University this year with a degree in English Education. When he�s not working, Michael teaches catechism at St. Joseph�s parish. He enjoys music, hiking and all kinds of outdoor sports. Welcome, Michael! 25 years ago: In December 1973, the KNOM volunteers produced an extraordinary version of Charles Dickens� �A Christmas Carole,� which we�ve broadcast every year since. According to eyewitnesses, Peter Van Nort was frantically editing the second half of the program with razor blade and splicing tape ? while the first half was already playing over the air! WE�RE SORRY TO REPORT that the grizzly bear and her cubs that were hanging around Nome in September and October were deemed to be a menace, and were shot by Fish and Game authorities. They�d tried to capture the bears for weeks. Among other places, the bears had been seen next to Nome�s elementary school, attracted to the easy food of trash cans and dumpsters. The bears� meat was donated to Nome�s senior citizen center and to the women�s shelter. www.knom.org That�s where you�ll find us on the Internet, with biographies of the staff, hundreds of pictures, and the past two years� �Nome Static� newsletters, with most photos in color. If you�re not a computer whiz, you may have a friend or a grandchild who can find our web site for you. Many libraries offer free Internet access, and friendly help, too. Our web site was originally supported by a KNOM donor, but is now being provided to us free of charge. CHRISTMAS INSPIRATIONAL SPOT: Tbe gentle creatures of the earth were the first to bow down before Him. Yet, since that time, He has brought great men to their knees. Mighty nations have surrendered to His Will. With humility, He has conquered the universe. With the humbleness of His birth, He has humbled all of us. For nothing has ever shaken--or awakened--the world so much as the birth of that one Little Child. top Always with a smile (left), KNOM volunteer Connie Fessel anchored the early morning show last year. 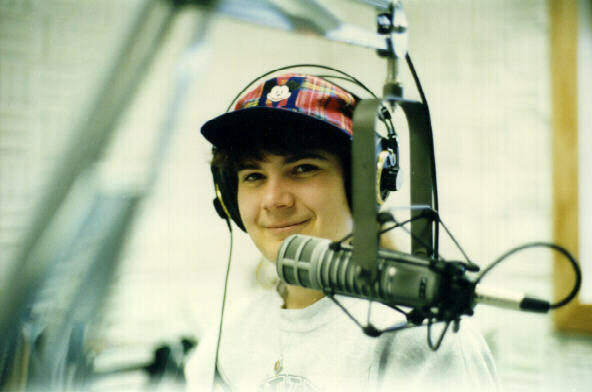 While you�ll still hear Connie on the air, most of the time she�s traded the microphone for a letter opener, as she helps business manager Florence Busch in the office. Starting next April, you�ll always find Connie with former KNOM volunteer and program director John Albers. That�s when they�re engaged to be married! CHRISTMAS INSPIRATIONAL SPOT: What the Gospel depicted in the Christmas story is not the revelation of a mighty, powerful king surrounded by a splendid court. What is shown is an infant, a weak and helpless infant in His mother�s arms. Christians look at this Baby and believe that He is the Son of God, the very image of God�s splendor, and recognize Him as the Lord of history. God�s wisdom contradicts the wisdom of the world. full size AN UPDATE OF OUR NEEDS: We have been generously given everything we need for our dubbing station, except for the audio mixing console itself. A simple, quality, professional mixer, the Audio Arts R-16 will cost $4,030. As you have read, we�re about to launch a large campaign to spark even greater radio listening interest in our deep fringe areas, by distributing up to 400 antenna signal boosters. For this exciting $16,000 project, we still need $9,150. Can you, or someone you know, help out? SURPRISE! 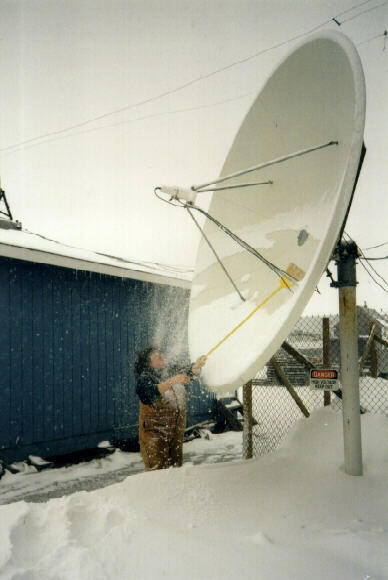 (left) Snow on your satellite dish will block the signal and many winter days will find one of us brushing off the antenna, once in a while with unexpected results, as Linda Raab discovered in March! Christmas and the Prince of Peace came to dwell among men, hoping to bring peace to all nations--to all families--and most of all, to each person�s life. It is still His wish today. May we each search for His peace this season. 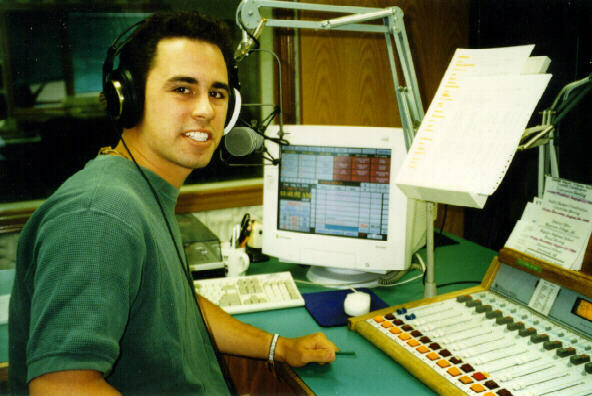 top OUR MISSION: The oldest Catholic radio station in the United States, KNOM is on the air to beam inspiration, education, information and companionship to western Alaska�s remote villages. It�s a scattered flock: If we were located in Washington, D.C., we would have regular listeners in Massachusetts and Florida, inland as far as Indiana. 90.2% of our operating income is from individual contributions by good people like you. DOWN FOR THE COUNT: By the end of the year, we will have aired more than 34,000 inspirational spots since January first?and an equal number of educational ones. We also will have aired Mass over 100 times, the Rosary every day, 3,128 local newscasts and about 450 hours of interviews and discussions of important issues. As of the last audience measurement survey, for hundreds of miles, 94.8% of adult villagers count on KNOM every day. MAY YOU HAVE A BLESSED CHRISTMAS! We know that many of you, like many of us, will not be with loved ones this season. To each of you we wish a Merry Christmas, and good health and joy during the New Year. God bless you!